There can be no doubt that climate change is already having significant impacts on the Arctic, the region that many scientists consider to be the ‘canary in the coal mine’ for global warming. Temperatures in the Arctic have risen almost twice as quickly as in the rest of the world, and there has been a long-term decline in summer Arctic sea ice which has accelerated over the last decade, with some experts suggesting that summer sea ice may disappear completely by the mid 2010s. We have this year seen significant loss of ice from two of Greenland’s glaciers — a piece of the Petermann Glacier about half the size of Manhattan broke away in July, and the Jakobshavn Isbrae glacier, one of Greenland’s largest, has retreated further inland than at any time in the past 150 years. These changes are already affecting Arctic ecosystems and communities, as well as increasing global sea levels. Climate change is not just a scientific or technical issue, but a cultural one. It is about how people and governments all over the world live with the reality of global warming, and the issues it raises about fairness, poverty and changing lifestyles. Artists and writers have an important role to play and it is vital that they are fully engaged in the debates about these issues. I am therefore delighted to be able to extend my support to the Cape Farewell expedition to Greenland. 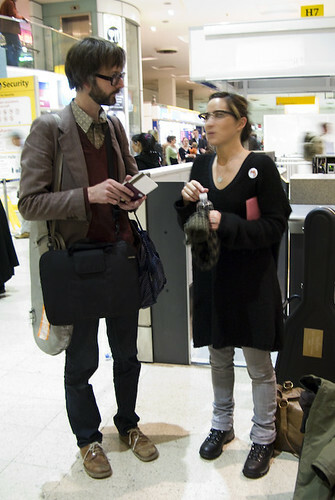 Jarvis Cocker and KT Tunstall swap travel stories at the check-in at Heathrow. We still don’t know if we can expect anything else to be in our container than toothbrushes but we hope to find our ARGO float somewhere in there. Let me tell you a little more about these fantastic pieces of kit. Observing the ocean is a costly and time consuming business. 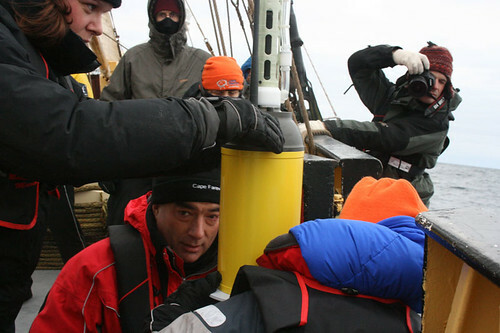 As our crew will soon find out, dangling a temperature and salinity probe over the side of the boat then hauling it up again takes a while and gives us one single profile of temperature and salinity – a speck in the ocean and a snapshot in time. ARGO floats are like self contained profilers, sinking to whatever depth we tell them to and then travelling along with an ocean current and popping up when we tell them to, transmitting temperature and salinity information back to the ARGOS satellite array, then sinking again for another cycle. With only a few hours to go before uniting with the first of the crew to arrive here in Iceland, and only a few more hours again before heading off to our launch point, we are down to the wire. Expectations are still unclear, although one of my soon-to-be crew mates’ blog posts reads “expectations set to the sun”. That seems about right. Later today I’ll travel with a group of musicians and other artists and a team of scientists to the west coast of Greenland. The Cape Farewell project has been taking creative people to the Arctic since 2004, and this trip has a particular emphasis on musicians (the crew list reads like a CD collection). The charge of ‘climate tourism’ is never far away, but at the launch event at the Science Museum KT Tunstall did a tidy job of explaining why she felt it was important to get to grips with the science, to see some of the evidence first hand, and to see what being holed up for ten days with 40 creative people would do to inspire her own work.